Survivors of shipwrecks on the subantarctic islands only had each other and their own resourcefulness to rely on. Marooned on isolated islands, they had to make clothes and shelter, get a fire going and find food. And there was always the fear that they might never be rescued. There were 11 shipwrecks from 1833 to 1908 in the subantarctic islands south of New Zealand. These islands are on the path that sailing ships took through the Southern Ocean to get to Europe from Australia. One group of survivors, or castaways, were on an island for 19 months before they were rescued. 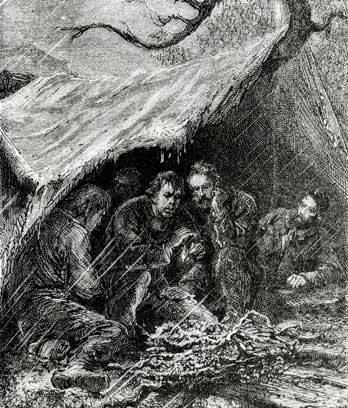 Castaways had to find food, build shelter from the wind and rain, and keep warm, as the subantarctic islands are very cold. Survival was hard as most castaways only had the clothes they were wearing when they landed. The survivors ate seals, pigs, goats, birds, eggs, shellfish, rabbits and roots. They made animal skins into clothes and shoes, sewing the skins together using birds’ bones as needles. They made huts out of branches and tussock grasses. Having a fire to keep warm was very important. It was also a sign to passing ships that people on the island needed help. Any matches they had were precious. Once they lit a fire they never let it go out. Castaways were resourceful. They made their own soap and alcohol, and for games they made chess pieces, cards and dominoes. Survivors also grew potatoes and tamed pigs and goats. They taught one another mathematics and languages. One man learnt to read and write. When they had no ink, they used seals’ blood to write with. Because so many ships were wrecked on the subantarctic islands, the New Zealand government built huts there, which were known as provision depots. These had boats, warm clothing, blankets, compasses, tools, matches, food, cooking pots, fishing gear, rifles and bullets. The government also took pigs, goats, cattle and rabbits to the islands and let them go so that in the future any castaways would have food. Some sealers and sailors, who weren’t shipwrecked, raided the depots for the food and clothes. Government steamships made regular trips to the islands to keep the depots stocked and to search for survivors. Often, when castaways began to think that they might not be rescued, they built boats. Sometimes they repaired a ship’s boat that they had come ashore in. Others built fragile boats out of branches, vines and canvas. Sometimes castaways were shipwrecked on an island with no depot, so they used the boats to get to a nearby island with a depot. In the end, most castaways were rescued by government steamers or passing ships. Shipwrecks on the subantarctic islands don’t happen now. This is because there are few sailing ships, maps are more accurate, and the Panama Canal was built, so ships take a different route.